Charles Ayling (later known as Edward Charles Daniels) was born on 17th February 1834 in Petworth , Sussex and baptised at St Mary’s Church, Pulborough a month later . He was the fifth of nine children born to James Ayling and Gaynor (Gainey) Baring. Contrary to a family myth that he left home at 15, changed his name and joined the Army, at 17 he was living at home working as an agricultural labourer, as were his father and brothers. He enlisted in the Scots Fusilier Guards, Private #4421, at Storrington, Sussex on 3rd October 1853 age 19½; his name change came after his Army discharge. Ayling served in the Crimean War from 1st June 1854 to 23rd November 1855 for which he received the Crimea and Turkish Medals with clasps for Alma, Balaclava, Inkerman and Sevastopol. Many years later, it was reported in a WA newspaper article, that he ‘fought shoulder to shoulder’ with John Craig, another veteran of the Scots Guards and former prison warder at Chatham who arrived in 1866 to take up an appointment at Fremantle Prison. On 1st February 1856 Daniels transferred to the Grenadier Guards, Private #9423, by ‘the authority of the General commanding the Army in the Crimea.’ In Australian accounts of his life this has frequently been confused with the Coldstream Guards. He was discharged in November 1856 ‘in consequence of a reduction of the Army, being of bad character’. During his three years with the Army he was tried and convicted by courts martial with punishments of prison time with hard labour and, on two occasions, fifty lashes. Ayling’s WO97 documents are available to us because his crime leading to transportation occurred after his discharge to pension. At some point Ayling moved to Kent and effected a change of name to Edward Daniels where, on 10th June 1859 he was charged with firing a shed, a farm building and a stack of wood – the property of John Lomas – at Gillingham. Whether he was working for Lomas and committed this act out of some grudge is not known. The Maidstone Assizes sentenced Daniels on 25th July 1859 to ten years’ penal servitude. In that same court, James Woodger and William Weir were sentenced similarly for arson and burglary respectively and would accompany Daniels throughout prison life and transportation. After serving a month or so in Maidstone gaol, Daniels – as he continues to be recorded – is sent to Millbank prison. He is recorded here as ‘late 23rd Regiment’ which presumably was a clerical error. After 12 days’ separate confinement he is sent to Pentonville and then to Portsmouth Prison on 13th July 1860. While in Pentonville it was noted that Daniels had a dark complexion, black hair and hazel eyes and was 5 ft. 10 ins. in height and of a proportional build. He was marked by the letter D [for deserter] on the left side of the body; a scar cut from thumb and first finger on the right hand and the same on the left hand; a mole on right wrist; ‘bracelet and crown’ on the back of right hand and ‘anchor’ on the back of left hand. Daniels and the other 69 prisoners from Portsmouth were medically examined on 17th September 1861 and the following day boarded the Lincelles, along with Woodger and Weir. The ship took on further prisoners at Portland and anchored there for two weeks during which Daniels was the centre of an incident. On 29th September William Crawford M.D., R.N., Surgeon Superintendent, was informed that the prisoners had succeeded in getting into the hold of the ship by way of the chain locker and that some bags of bread, potatoes, articles of apparel, knives and saws had been passed up to the prison deck. The informant had been Edward Daniels. Crawford wrote in his journal: I am rather embarrassed as to how I am to dispose of the Prisoner E. Daniels from Portsmouth Prison who I had appointed Captain of that Division and from whom I gained the earliest and most important information in reference to this occurrence. I have reason to believe his life would not be safe in the Prison and I have removed him into the Military Hospital for the present, pending direction what ought to be done. The only further reference to Daniels’ situation was made by Crawford on 5th October, No information concerning Daniels from the Colonial Office. Did Daniels, I wonder, inform on his pals from Maidstone? The voyage on Lincelles was 115 days and arrived in Fremantle on 29th January 1862. Daniels commenced his first working assignment on 31st December 1862 and over the next few years worked as a farm labourer in the Swan District for employers Messrs. Hornby, Bradford, Jones, Morley and Brockman at an average wage of 40 shillings per month. Under the terms of this ‘ticket of leave’, Daniels would have been required to stay in the same District and report to the magistrate each month. Daniels married Harriett Emily Hill at Gingin on 9th February 1865 who bore him 12 children between 1865 and 1890; not all survived to adulthood. Apart from a charge of drunkenness for which he was fined 5/- by the Resident Magistrate, Daniels kept his nose clean. In June 1866 Henry Brockman, Commissioner of the Peace and farmer for whom Daniels worked, granted him the right to farm for himself in Gingin. He received his Conditional Pardon on 13th August 1868 and continued farming, employing ‘ticket of leave’ men himself. The birth registrations of some of the Daniels’ children give us an insight into the farming areas in which Daniels worked: from Gingin in the west, Ashburton and Roebourne in the north and Esperance in the south of the State. He and Harriett moved to 21 Violet Street, West Perth c. 1900/1901. In 1908 either the street numbering changed or the couple moved into a different house because thereafter they lived at number 19. Once in Perth, Daniels entered into the life of an Army veteran. He attended the annual King’s Birthday Navy and Military Reviews. He was a regular at the South African Association dinners. He attended the first Commonwealth Annual Dinner in 1907 and went to thirteen of them until ill health precluded his appearance. These get-togethers by other Crimean War and Indian Mutiny veterans were also known as ‘The Old Warriors’ Dinner’, ‘The Veterans’ Dinner’, and ‘The Old Guard Dinner’. At the dinner in May 1921, a few days before Daniels’ death, His Excellency the Governor noted Daniels’ absence with regret. In October 1913 Daniels had his right leg amputated and it may have been then that he realised the potential of his status as a Crimean War veteran. The amputation would later be attributed in the newspapers as occurring during the Crimean War! The Senior Military Chaplain, Bishop Riley made a public appeal for funds to cover Daniels’ medical bills and purchase of crutches, a firm bed and an easy chair. This was necessary, wrote the Bishop, because He [Daniels] has fallen upon evil days and requires a little help…… Daniels and his wife have 20s. a week and he draws a pension of £9 2s. 6d. a year. The appeal ran for six months, the West Australian newspaper publishing the progressive totals; by June 1914 £34 17s. 3d. had been raised. Further assistance came during March: This afternoon the ever charitable Police Band will give a high-class concert on The Esplanade, the proceeds to go to the fund in aid of Crimean veteran C. E. Daniels. In view of the particularly deserving nature of this case it is to be hoped that the public will not be sparing in their attendance or contributions. After the Veterans Annual Dinner of May 1919, it was reported that: There are 29 of the old warriors in Western Australia, and nearly all were present at the dinner. Old Mr Daniels, crippled and using a chair as a means of transporting himself, and many other white haired and tottering veterans were in the assembly. The newspaper appeals continued after Daniels’ death when a friend of his widow took up the cause on her behalf. Harriett Daniels’ eviction from the Violet Street home where they had lived for 22 years was imminent. [She] has notice to quit, as the property is to be sold. Many friends and others have from time to time given a little help, but the uncertainty and spasmodic nature of the assistance does not seem a fair deal toward an old lady 70 years of age, who has presented Western Australia with eleven workers and their families. Daniels died on 26th May 1921 at the couple’s rented home at Violet Street. His death certificate records the cause of death as syncope, arterio sclerosis and gangrene. He was accorded a military funeral where his remains were placed on a gun carriage which proceeded by road to the burial site at the Anglican section of Karrakatta Cemetery. Daniels’ wartime comrade Sergeant John Craig, aged 89, attended his funeral together with a number of family members. Parish Church of Pulborough, Sussex Registers, West County Record Office, Chichester. Census Records of England & Wales, 1841 and 1851, National Archives. Royal Hospital Chelsea Soldiers Service Documents 1760-1913, National Archives. Crimean War Medal Roll 1854-1855, WO100/22-34, National Archives and National Army Museum Chelsea in conjunction with Yesteryear Genealogy Supplies. Judge Advocate General’s Office, General Courts Martial Registers, Abroad 1779-1960, National Archives. Homes Office and Prison Commission Registers, National Archives. 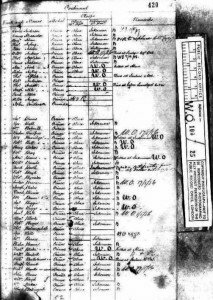 Home Office Convict Transportation Registers, National Archives. Surgeon Superintendents’ Journals, National Archives. Convict Establishment General Registers Acc 1156, State Records Office of Western Australia. British Newspaper Archive 1710-1953, findmypast.com website. TROVE Newspaper Archive, National Library of Australia website. Steve Williams (WA death certificate of Charles Edward Daniels). Arlene Shailer & Carol Curran (photographs of Charles Edward Daniels).